I am often asked what materials I use when out sketching, or drawing at home, type of pen, type of colours, and so forth. This is the answers page. I draw in pen, and my choice of pen has evolved since I started sketching. For a long time my preferred pen was the black Pigma Micron, size 01, by Sakura. I draw small. Sometimes I will use size 02 or 03, and occasionally an 05, but I also like the thicker Pigma Graphic nibs for a thicker line. Most art stores in the US carry Pigma pens. The black is the darkest black I’ve found in this type of pen. However the nib wears down quickly, especially as I have become more detail-heavy. These days I use almost exclusively a brown-black pen, the Uni-ball Signo UM-151, size 0.38. The brown-black doesn’t run with a wash, but the black version does. This is the most accurate and reliable pen I’ve used, and it comes in a load of different colours too. 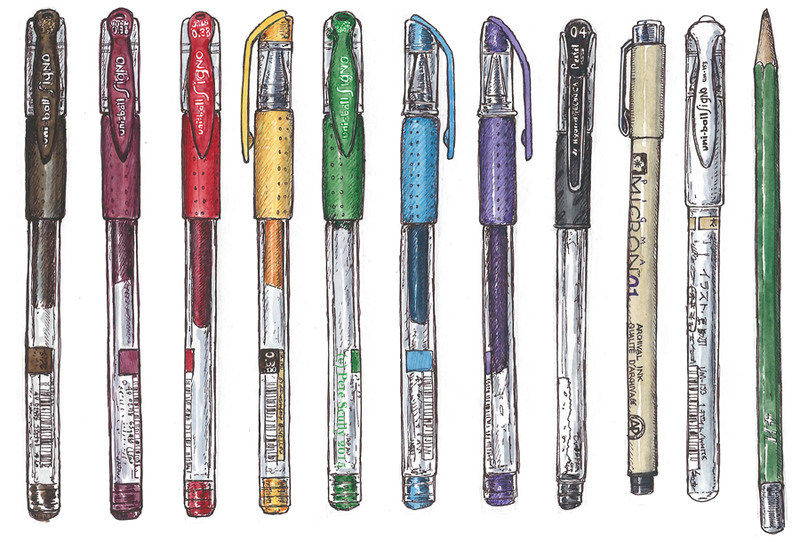 I can’t get them in regular art stores, but I order them from Jetpens. Another pen I sometimes use is the Copic Multiliner, again preferably in size 0.1. There are a few different colours which are nice to sketch with, particularly the dark blue. None of these are easy to find in art shops in the UK. When in London, I usually pick up Uni-Pin Fineliners. I also use Staedtler pens, but they can’t even come close to the the Pigma Micron. The Pigma Sensei is a nice alternative though. Sometimes I will use the Uniball Vision Micro, which has a far more reliable nib but can’t get as fine as I like it. Occasionally I will use a regular biro. Drawing with ball-point pen is a lot more fun and a lot more versatile that you might imagine. I tend to draw in pen first, sometimes with a few H2 pencil lines for perspective or compositional purposes, and then add the colours. I colour my sketches with watercolours. 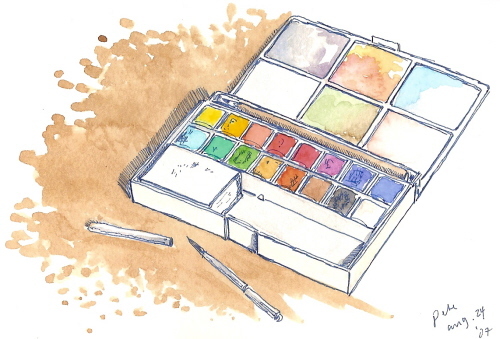 I use the Winsor and Newton Cotman range, I believe the box I have (above) is the ‘deluxe sketcher’s pocket box’. This was sketched in 2007 and I still use the same box – it is a lot messier looking now! I have used the additional space in this box to add lots more colours; I like having choices at my disposal (similarly i carry loads of pens with me in my case, and tend to actually use about two of them). The half-pans are good, and when they are done I sometimes refill them with the tubes; fortunately these paints are available at most art stores in the US and UK. I usually mix my colours in the little pans. For colours, Payne’s Gray is extremely important to me, as is Ultramarine. I always carry a tiny jar of water which fits into my small bag pocket (and doesn’t leak! make sure you have a good lid). I have a smallish brush with a long pen-sized handle, which I have gotten a lot of use out of, plus a slightly bigger one for colouring the sky and a slightly smaller one for painting thin details. 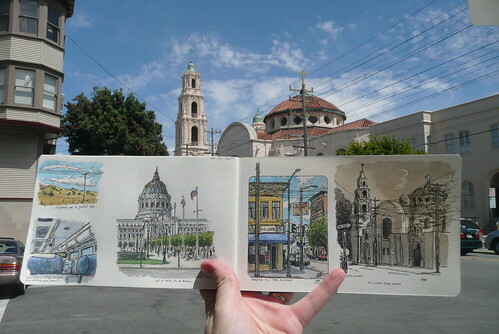 After the first Urban Sketching Symposium in 2010 in Portland I cracked and started using a waterbrush. I got a few Koi waterbrushes, inexpensive and available in most places. I was told that once I started using one, I wouldn’t stop… but nah, I totally stopped. Those Koi ones just weren’t good enough. 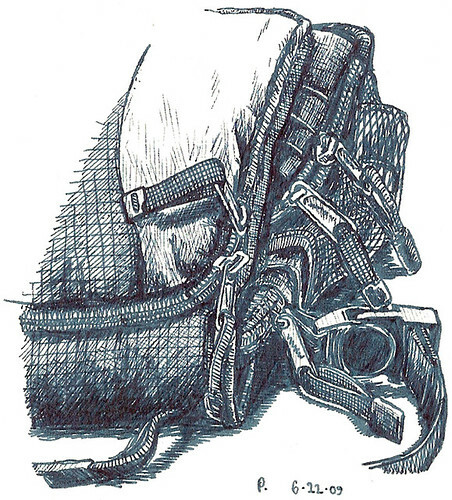 The 10-10-10 in the sketch of the waterbrush above is the date, not the judges’ score. And then at the 2018 Porto Symposium we were given a Winsor and Newton waterbrush as a freebie and I must say it’s so much better. I tend to use it a lot when I am somewhere I really can’t hold a little water jar, and it’s been fine. 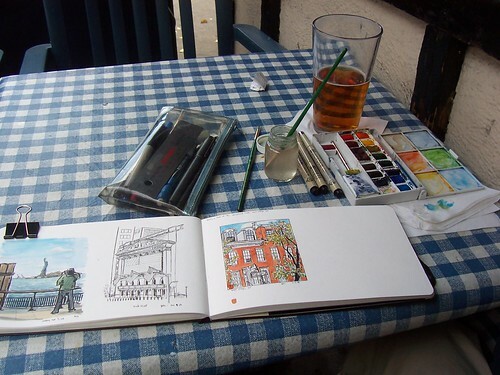 For years I primarily used the larger-format (8″x5″) Watercolour Moleskine. I have filled loads of them already. They suit the size of sketch I like to do, and the paper takes the watercolour really well (unlike the regular moleskines, which hate watercolour). The only thing is the widescreen size makes it a little awkward to hold. However since the paper quality changed slightly in the newer ‘Art Plus versions, I I tend to use the smoother paper of the Stillman and Birn ‘Alpha’ sketchbook, 9″x6″ landscape format. They fold flat, and are slightly bigger with slightly thinner pages, but take a wash pretty well and are good on the pens. I alternate using those with the Seawhite of Brighton sketchbook, landcape 8×5″, which I buy very cheaply when I’m in London (about five quid at Cass Arts). These don’t feel as quality as the Alpha but I’ve done some of my favourite sketches in these and they are a very handy size, so I’ve grown to love them. Neither of them have the handy pocket in the back like the Moleskine though, which is invaluable. Occasionally I draw in my Moleskine Diary, and I enjoy drawing in the small Moleskine Cahiers, which have very thin paper but are a dream when using a Copic multiliner or the Uni-ball Signo. I also like the WH Smith sketchbooks (only in the UK), the suede-bound ones are very nice with their wrap-around cord, and the spiral-bound cartridge paper ones are nice too, and have sturdy backs. 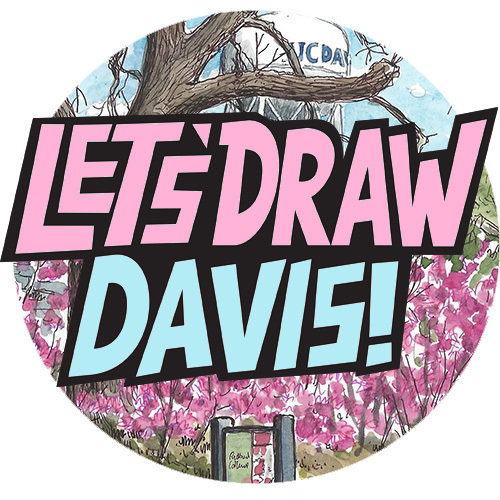 You can see many of my sketchbooks on my recently updated “Sketchbooks” page. I am pretty particular about my bag. I need one that will fit my sketchbook and pencil case in it with room to spare for a book or a sandwich or a camera, but not so much room that I fill it and weigh myself down (this happens a lot). I want to enjoy walking about my cities, not feel like I’m backpacking across Europe. I have a small Eddie Bauer shoulder-bag with lots of little compartments, including pockets on the side for my water-jar. This goes everywhere with me. I also have a larger Timbuktu bag which is handy when I bring larger format books out. However I recently got one of those Travelon anti-theft messenger bags which is a good size for all my things and keeps everything well protected. 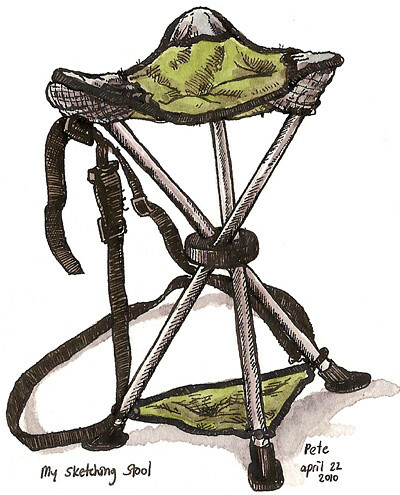 To save my bottom from getting dirty on the pavement, I sometimes carry a lightweight Trail Stool, which I got from REI (see it here). I attached a camera-bag strap to it so I can carry it over my shoulder and it’s so light I don’t even notice it. However, in recent years I have embraced standing and sketching. It can be uncomfortable after a while, but you get a better view. It’s very handy to carry some sort of photographic device. I have an iPad Mini (it’s the same size as my sketchbook) Whenever I don’t have time or inclination to add the colour on-site, I usually make useless little notes (“sky=blue, grass=green“, in case I forget), but it’s easier to snap a pic with the iPad to help my memory later. 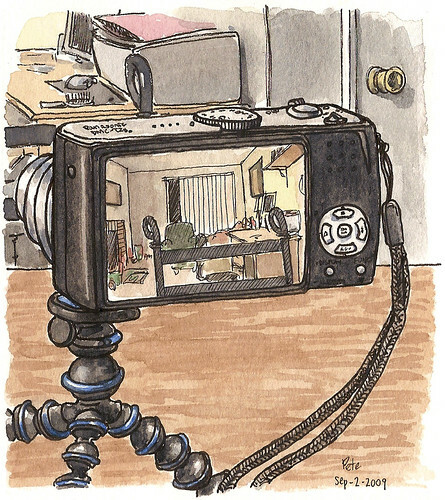 It’s also good for photographing the sketchbook on site. Cameras can never see the way your eyes do (I can’t draw from photos the way I can from real life, because there’s no sense of real 3D space), but don’t turn your nose up at using them to help you finish your drawings later. I also carry sunscreen, and a hat. Might seem obvious but I’ve been burnt on foggy days in San Francisco and it ain’t nice. I tend to sit in the shade. Not so much glare on the paper. One last thing: this is just what I use, and it came from trying out things until I found what I was most comfortable with. I’m still trying things out, learning what I like. 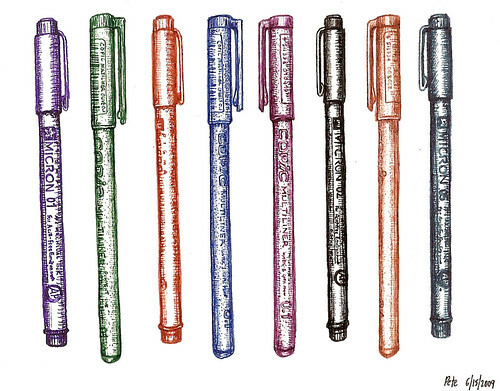 You need to use what you feel happiest using; if you can only use the most expensive pens and finest paper, excellent, and if you feel happiest with a 50 cent ball-point pen and some graph paper, then that is what you use. It has to be personal. Drawing is not about using the ‘right’ or most expensive tools but simply enjoying what you do. You don’t need studded boots and corner flags and a referee’s whistles for a good game of football – just a round ball and a couple of jumpers for goalposts. That’s it.